Americas Container Technology Market size was estimated at over USD 300 million in 2016 with a CAGR of over 35% from 2017 to 2024. 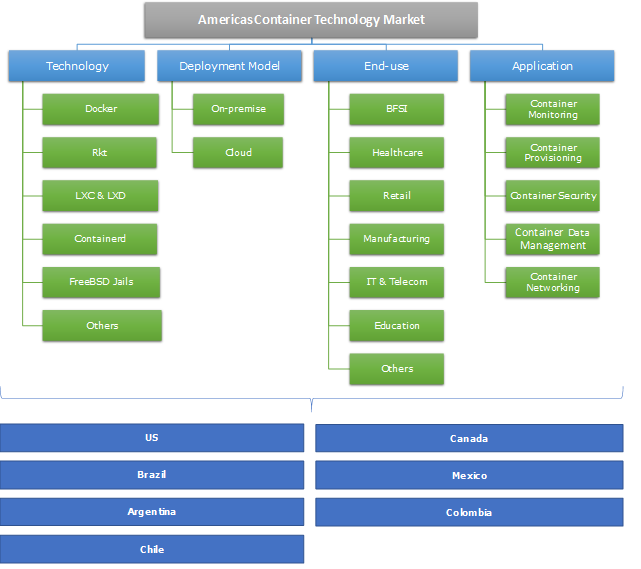 Americas container technology market is registering swift growth owing to the availability of highly advanced ICT infrastructure in the U.S. and Canada along with increasing focus on technology innovation and strategic expansion by major players. With major technology and infrastructure providers operating out of the U.S., there is abundant adoption of container technology in North America. As enterprises in the region readily accept innovative technologies, the market is expected to dominate the global container technology landscape over the next 5 to 10 years. With key global players in the cloud computing and data center industry investing heavily in countries such as Brazil and Mexico, the Latin American container technology market is expected to exhibit lucrative growth during the timeline. Moreover, governments in this region are taking favorable measures to speed up the adoption of the cloud technology, SMEs in the region are likely to move their application processing and data storage to cloud platforms for optimizing their processes in a cost-effective manner. Docker will continue accounting for the majority of the North America container technology market by 2024 with a revenue share of over 70%. This can be credited to the large scale adoption of the technology by U.S. based enterprises for efficiently managing abundant application processing functions. Rkt is projected to exhibit the fastest growth during the timeline with increasing awareness related to the technology and increasing support by major cloud platforms. In Latin America, Docker is expected to hold a significant market share during the forecast period due to increasing inclination of SMEs operating in the region towards the technology for cost-effectively deploying and executing computing functions using containers. Rkt, is expected to witness the fastest growth during the timeline owing to increasing adoption of the technology in the region. Container data management industry is expected to hold a majority market share of the North America container technology market by 2024. With accelerated adoption of containerization technology, the need for effectively managing applications wrapped up in containers is being increasingly recognized by enterprises. Container security application will grow with the highest CAGR during the forecasted period owing to growing concerns over the safety of critical data hosted inside application containers. Similarly, in the Latin America market, container data management function will hold a majority revenue share by 2024. Whereas, container security function will witness fastest growth between 2017 and 2024. On-premise deployment model is projected to dominate the North America market due to significant investment on in-house IT infrastructure by enterprises operating in the region. Cloud deployment model will emerge as the fastest growing segment by 2024 owing to rapid adoption of cloud solutions by organizations in the region to benefit from the dynamic nature of the service offerings enabling cost-effective resource utilization. In the Latin America market, on-premise deployment model is projected to hold a majority market share of over 70% by 2024 due to security concerns associated with hosting critical data over cloud networks and lack of robust data security measures in the region. On the other hand, cloud deployment model will experience the fastest growth between 2017 and 2024 due to majority of the global cloud service providers establishing cloud centers in the region to offer data residency to the local enterprises. The growing demand for advanced virtualization solutions to host resource-intensive compute functions over cloud networks by organizations in the BFSI industry who produce huge volumes of critical data on a regular basis will drive demand across the sector. IT & telecom will emerge as the fastest growing segment owing to the robust growth of the U.S. IT industry and recent technological advancements by telecom companies in the region to improve their existing network infrastructure using cloud platforms. Similarly, in the Latin America market, the BFSI sector will hold a majority market share between 2017 and 2024 due to increasing awareness about cloud computing among the enterprises operating in insurance sectors in countries such as Brazil and Mexico. IT & telecom sector in this region will grow with the fastest CAGR with governments in the region encouraging modernization of existing IT infrastructure. U.S. is expected to dominate the North America container technology market with over 80% market share by 2024 owing to the extensive presence of major players in the technology as well as infrastructure sector including Docker, CoreOS, AWS, Microsoft and IBM. With availability of robust IT infrastructure and technological expertise, the market will be characterized by consistent product development and commercialization by leading and emerging players operating in the region. 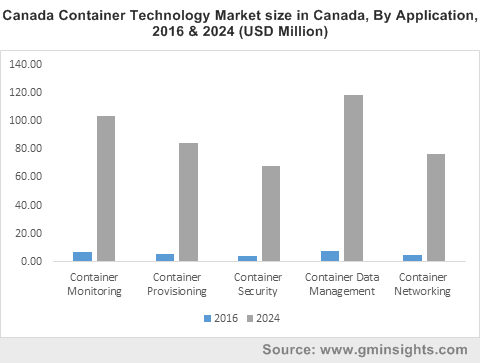 Canada market on the other hand, is expected to witness fastest growth during the timeline due to high awareness about container technology among Canadian enterprises and excellent cloud service infrastructure provided by key players such as Microsoft and Amazon. In Latin America, Brazil is expected to hold a majority market share and grow with the fastest CAGR as well, during the timeline, due to large scale investment by major data center service providers in the country in response to the growing demand for modern cloud services by Brazilian businesses. Companies operating in the Americas are emphasizing on technology innovation and strategic regional expansion. The technology providers such as Docker and CoreOS are consistently improving their container solutions to accommodate applications from a diverse set of computing platforms and efficiently integrating these solutions with different cloud platforms. Cloud service providers on the other hand, are more focused on expanding their services into untapped marketplaces to capture a major market share by establishing data centers in strategic locations to expand their existing customer base. Container technology has emerged as a cost-effective approach to virtualize applications irrespective of different compute environments throughout their lifecycle. When compared to virtual machines (VMs), containers offer virtualization right at the OS-level, which saves considerable amount of space required to deploy and execute resource-intensive workloads. These capabilities of containers allow enterprises to deploy clusters of applications in data centers for a relatively low cost compared to VMs. Enterprises operating in the North America region are readily adopting containers for effective application virtualization. Whereas, organizations in Latin America are increasingly adopting cloud computing technology to enhance their traditional IT infrastructure.